Be sure to hope on over to the blogs of our other design team members!! As part of our blog hop, we're giving away our entire January Digi release to one lucky blog hop participant! PLUS, we have an adorable freebie for EVERYONE who participates in our Spread the Love blinkie campaign! If you came here first, please hop over to the Sweet 'n Sassy Digi Blog to begin. From there hop to each of the following blogs (in no particular order): Micki ♥ Sandy ♥ Deedee♥ Melanie ♥ Nicole ♥ Lynne ♥ Korin ♥ Leah ♥ Ceal ♥ Darsie ♥ Janette ♥ Kim ♥ Lorie ♥ Nancy Thank you for visiting and enjoy our hop! The latest issue of Scrapbook News & Review has been posted! 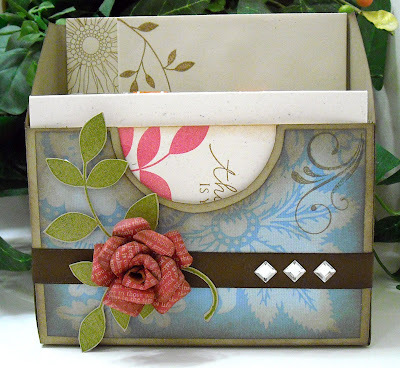 This month, I have an article on embossing posted in the stamping section. You'll need subscribe in order to read the entire piece but it's only $4.99/month to join and have access to hundreds of layouts, tutorials, and techniques so get on over their and subscribe! 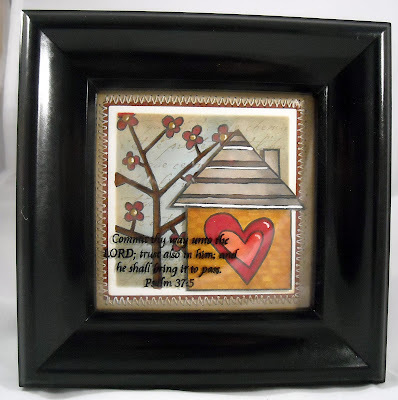 Included with my article is a tutorial on the faux cloisonne technique. For those of you who don't know...I didn't...Cloisonne is an ancient, multi-step metalworking technique that is used to produce jewelry, vases, and other decorative items. The technique can be used for enamel or for gemstone inlays. In either variety, the shape making part of the design is surrounded by a thin metal edge to form a compartment. With enamel, liquid enamel is poured to fill the compartment with gemstones, a pre-cut matching piece of inlay is then hammered and glued into place. Whew!! That's seems like a lot of work...Good thing all you need is a few old magazines and a jar of gold embossing powder to recreate the same look. 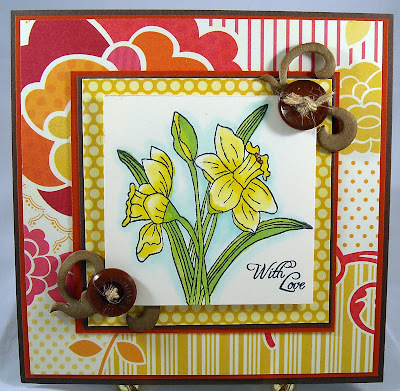 Creating a cloisonne look is super easy and a great way to add bold, colorful images to cards and scrapbook pages. You'll need to read the SNR article for the entire tutorial but I will provide you with two helpful hints; 1) I found that using a picture with lighter colors worked better than darker and 2) this technique is meant to work with outline stamp images. And here is my finished card, complete with two faux cloisonne flowers! The floral images are from Papertreyink and I believe (this card was made a few months ago) that the paper is from Bo Bunny, which was purchased at my local scrapbook store, Wholly Scrap. I loved trying out this technique since I never have before...how about you? Have you done this technique before, did you like it, have any cards you'd like to share?? :-) Feel free to leave a comment with a link back to your gallery...I'd love it see your work! Enjoy your Friday!! Sweet 'n Sassy Digi Release Day!! Today is release day over at Sweet 'n Sassy and Korin has some lovely digi images in store for you today! 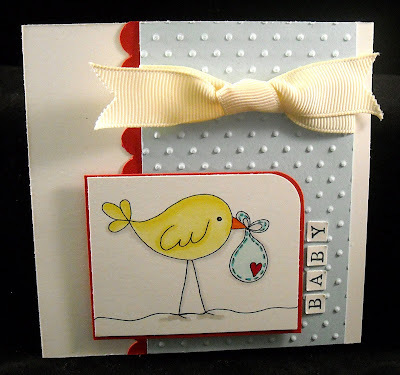 One of them is this adorable birdie...how perfect is this for a baby shower or welcome for a new baby?? I love his chubby little body!! Since I was creating late last night I kept my layout fairly simple. This is a 4" square card, one of my favorite gift card sizes, that I've layered with a piece of pale blue (embossed with my new polka dot embossing folder!) 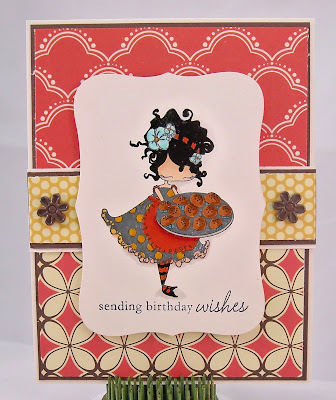 and scalloped red cardstock. 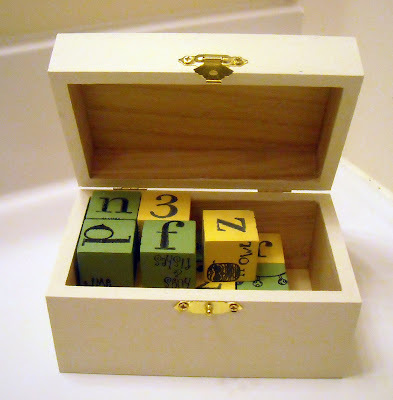 I added the word 'baby' by punching out letters from an alphabet set. Be sure to check out all of the wonderful creations that will be posted on the other DT blogs; links are on the left! Enjoy! About a month ago I started to create a card for an assignment. Got the entire thing assembled and then realized that the paper I'd chosen, which I adore, (Cosmo Cricket paper pack from Taylored Expressions) just didn't work with my image. So I put the entire piece aside and there it sat until one evening last week when the light bulb went on (those light bulb moments don't happen very often! LOL!) and I remembered that I had purchased a few of these darling LuLu stamps, from Stamping Bella, after our Stamping Around VT event that would be perfect with the paper and layout. And this card was born! I love these images! Aren't they just adorable? I can't believe this cutie sat in my closet for so many months without seeing ink! My LuLu, named Harriett, was colored with Copic markers and her hair, stockings, and shoes also got a layer of glaze...isn't that stuff amazing? Love it! (You can see the shine in the first photo). I then added a birthday sentiment from PTI to the bottom of my die cut Harriett and attached her with foam tape to the front of my already completed card....now that was easy! Anyone ever create a card base without an image, just to have on hand when the perfect image emerges? That might be a time saving way to create a quick card when needed! Enjoy your Tuesday!! 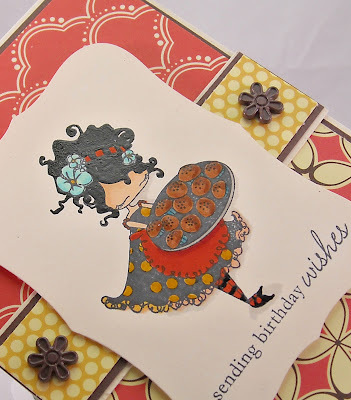 Today's tip: Use a textured cardstock and rub ons for added dimension...that....and...copy a friend's adorable card layout to create a quick card! ;-) That's right...I admit it, I used a layout that Julie created during her card class on Friday night to serve as a jumping off point for today's Keep it Simple card. Thanks Julie! 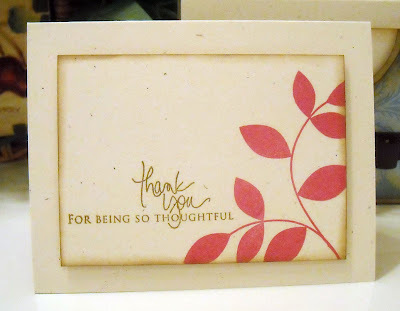 My card was created using Bazzill cardstock along with an adorable rub on from American Crafts, which I picked up at Wholly Scrap. I dyed a piece of ribbon, using my Copic markers, to match the coral color cardstock peeking out from the bottom of the card, and added a row of polka dots from a Papertreyink set. 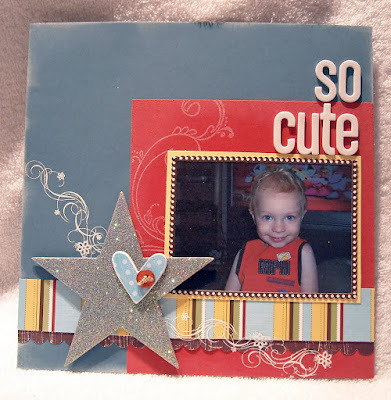 This is one of those great layouts that can be used for any occasion or stamp! Good thing Julie has a good eye for design! :-) Enjoy!! It's time for another SALT challenge and this week's topic is "daily" or more specifically spending time with God on a daily basis. Tanis was our challenge host and she shared a few points regarding her topic: Psalm 68:19 - Praise the Lord; praise God our Savior! For each day he carries us in his arms. Know that you are DAILY accepted and DAILY forgiven if you are DAILY returning to God for forgiveness. 1 John 1:9 - But if we confess our sins to him, He is faithful and just to forgive us our sins and to cleanse us from all wickedness. DAILY trusting Him with our problems and concerns. 1 Peter 5:7 - Give all your worries and cares to God, for he cares about you. Isaiah 33:2 - But Lord, be merciful to us,for we have waited for you. Be our strong arm each day and our salvation in times of trouble. DAILY talking to Him. 1 Thessalonians 5:16-18 - Always be joyful. Never stop praying. Be thankful in all circumstances, for this is God’s will for you who belong to Christ Jesus. DAILY claiming His promises. Lamentations 3:20-25 - The faithful love of the Lord never ends! His mercies never cease. Great is His faithfulness; His mercies begin afresh each morning.I say to myself, “The Lord is my inheritance; therefore, I will hope in Him!” DAILY praising Him in all circumstances. Psalm 42:8 - But each day the Lord pours his unfailing love upon me,and through each night I sing His songs, praying to God who gives me life. Psalm 96:2 - Sing to the Lord; praise His name. Each day proclaim the good news that He saves. As I said to Tanis when she announced this challenge, "excellent topic!" It was a wonderful reminder to not get too caught up in our every day activities that we neglect our time with God. I have a tendency to review the course of my day when I crawl into bed at night and far too often my heart sinks as I realize I failed to spend any quality time with the Lord. Oh, I have study with the kids and as a family but it can be difficult to find time to spend alone with Christ. And how much grace do we need as Moms! (I need lots! LOL!) It's hard to overcome the trials, even small ones, if we've failed to seek God's help. I pray that for today and the days to come that I'll strive harder to be a better committed, DAILY Christian, who is faithfully showing my love and gratefulness to Christ for all that He has done! Please stop by the SALT blog to see the team's amazing work and play along with our challenge!! Card details - I've been getting more and more drawn to the very simple card layouts...This one is no exception! I saw this fun layout from an old CARDS magazine and loved how the matted layers were off center...fabulous! 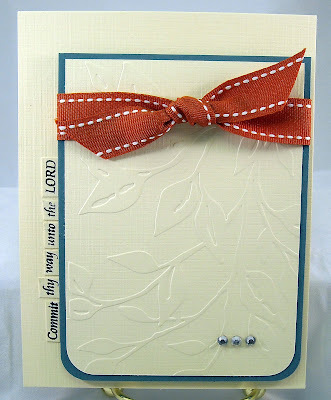 I also just received a few new embossing folders and used one for the main layer of today's card. 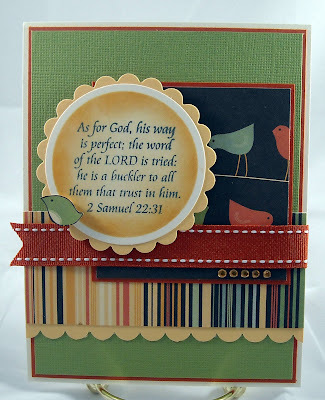 I portion of a Scripture verse, from a Sweet 'n Sassy set, was cut apart and added up the side of the card. Can't get much easier with this one!! :-) Enjoy! 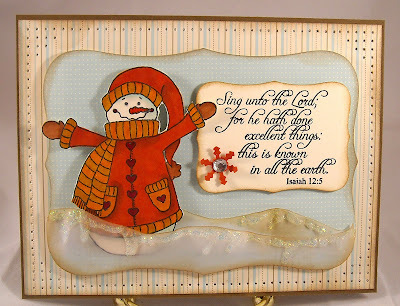 This this guy was posted on the Sweet 'n Sassy blog yesterday, another card created with the darling snowman from the newly released Love You This Much set. I love all of this month's releases but I think he has to be my favorite! He's easy to color and a breeze to cut out...that rates right up there with an all time favorite in my book! I paired my snowman with a verse from the Melody of Love set that was also released earlier this month. With my snowman's arms out to his sides, it looks as though he was rejoicing so I thought the verse was a perfect match! 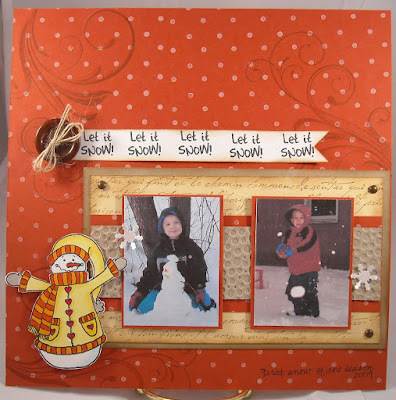 The image was colored with Copics and I created the faux snow by cutting curves out of vellum and attaching to a label die cut (created with Nestibilities die cuts). A thick layer of Stickles was added in various spots on my snow hills for a little sparkle and shine. 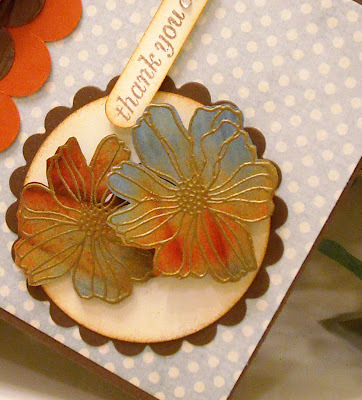 Today's Tip: One only needs a sentiment and embellishment to create a card! This may be one of the quickest cards ever created! It took me no more than five minutes to make and most of that time was spent picking out a sentiment! :-) A few weeks ago I contacted Mary Fish, a SU! demonstrator who hosts the most amazing blog, filled with all kinds of delightful SU! creations. I asked Mary to send me a copy of the latest mini catalog and when it arrived it included a few paper samples and two darling embossed die cuts; a pink heart and this darling brown butterfly. (Thanks Mary!) 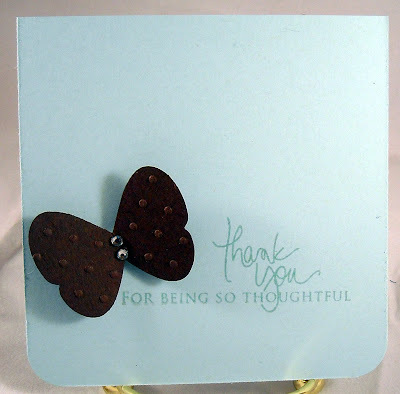 I used the butterfly (with two rhinestones added) and a sentiment from Papertreyink to create a sweet 4x4 card. How's that for a quick creation?! I'm not sure I could ever beat today's record...LOL! Enjoy! 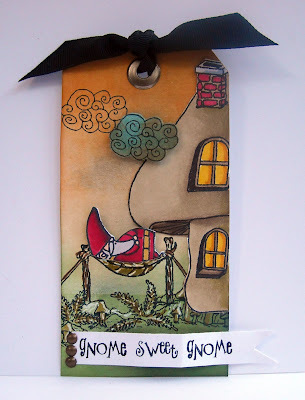 PS - Be sure to check out the Sweet 'n Sassy blog tomorrow as I'll be posting a SNSS creation! It's time for another sketch challenge! The Sweet Shop has posted it's sketch for this week and it's a great one! 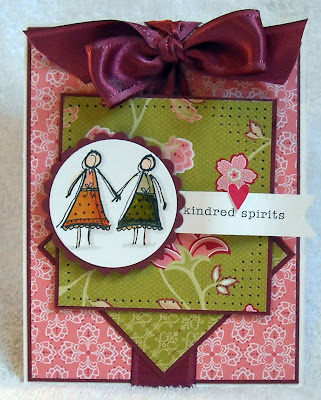 I love the simple design of the sketch with the fancy embellishments at each corner of the stamped image...lovely! 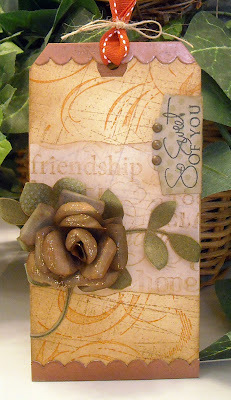 This Sweet 'n Sassy image is part of the Flower of the Month stamps that were released last week. This is such a pretty Spring design...it's making me long for warmer weather since we've been down in the single digits this week...brrrr. The flowers have been colored with Copics and this marvelous paper is from an Cosmo Cricket paper pack purchased from Taylored Expressions. 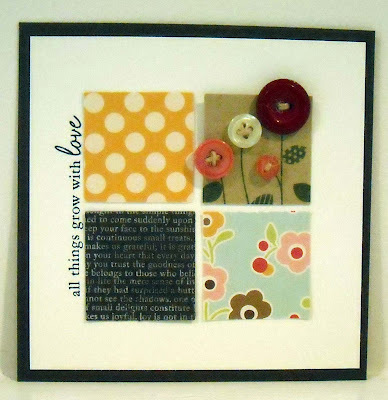 My corner embellies are a combo of Mayo Road chipboard swirls and buttons from Papertreyink. Be sure to stop by The Sweet Shop to see the team's beautiful creations and to add your link to the list!! Some of our dear friends recently purchased their first house...after almost 30 years of marriage! It was cause for celebrating! I put together a little housewarming goodie basket, filled with the things we used to constantly borrow from each other when we used to live next door to them. It was kind of a silly reminder of the numerous "can I borrow..." phone calls. (Once I called, desperately looking for cream of chicken soup after I realized that, for some reason, I only had about 15 cans of cream of celery soup in my pantry! Good grief, what in the world did I think I would do with all those cans of cream of celery soup? LOL!) The wife of this couple is also one of my stamping buddies so I had to give her something handmade! A few days before they moved, I had picked up a package of frames from Target and thought that a little framed art for her studio would be perfect! The images used for my art piece are from Unity...A few of my favorites, a tree in the background and the house layered, with foam tape, on top. I did stamp a script image and added some color to the square before stamping and coloring the tree. 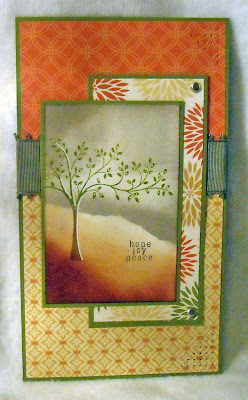 The square with the images were layered on top of rust and kraft cardstock and then I stitched around the entire piece. You can just make out in the photo (I should have taken a picture before I put it in the frame! ), that I added tiny bricks to the house my using a colorless blender pen to take away part of the house color. (Click on the image for a larger view.) As a finishing touch, I added a Bible verse, from Sweet 'n Sassy, to the glass, "Commit thy way unto the Lord; trust also in Him; and He will bring it to pass." Psalm 37:5. The verse is a little hard to see in the photo, better in person. I did find out something new...Once I stamped the verse, it was a little hard to see so I went over all of the lettering with a fine tip Copic marker. Worked perfectly! Enjoy today's little (it is little, just about 3.5 x 3.5) project!! Sweet 'n Sassy has started a new challenge called Motivate Me Monday! And who couldn't use a little motivation on a Monday? I know I was certainly dragging this morning! ;-) The MMM challenges will be posted on the Scrapbook News & Review site; you can find the first challenge, Let it Snow, here. (You may have to join the group in order to see the challenge and/or post comments.) The best part? There are prizes, which will be rewarded on Friday (1/15)!! Here are the details... Make a creation based on this week's challenge (Let it Snow) and then upload it to the SNR gallery. Be sure to list the following keyword in the Tags section: MMM1. If you play along with us and upload your creation by 10am EST on Friday (1/15), a winner will be selected from the list of participants to win their very own Love You This Much stamp set! AND...if you share your creation by 10pm EST (7pm PST) tonight, you'll receive a coupon for free shipping on your next SNSS order! How is that for motivation??? IMPORTANT NOTES: You don't have to use Sweet 'n Sassy Stamps or digis to play along with the challenge. However, if you do use a SNSS image (stamp or digi) your name will be entered into the drawing twice! After you upload your project, please be sure to post a comment to this challenge thread that includes 1) a link to or photo of your creation and 2) your email address for the early bird prize. If you prefer not to share your email address publicly, please email it and a link to your challenge project directly to Korin at korinstamps@comcast.net. As for my creation...I actually made this over the weekend, before I knew about the MMM Challenge! I saw an adorable scrapbook page in an advertisement and knew that my SNSS snowman would be perfect for a page documenting this year's first big snow fall. 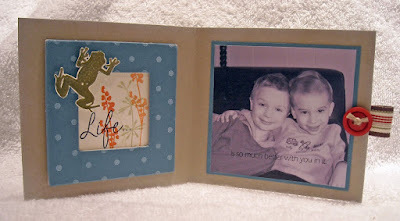 To create my 8x8 layout, I stamped a polka dot image over the entire page and then added a few swirls (Papertreyink). A few layers of paper, that has been stamped with different background images or embossed, were layered together before added the photos. This served as a nice frame for the photos. My darling snowman was colored with Copics (in color coordinating attire, of course!) and attached with foam tape. 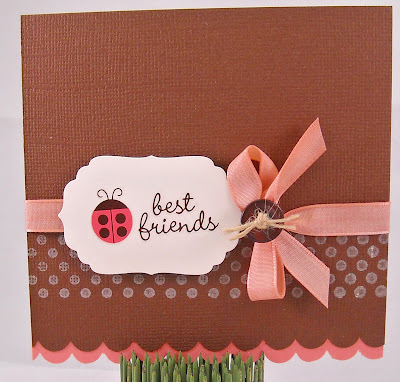 I stamped the sentiment, which is included with the stamp set, a number of times across a piece of white cardstock before cutting into a ribbon shape and attaching with a brown button (PTI). A few shimmery snowflakes were added to photos for a little pop. (You can click on the photo for a larger view of the project). 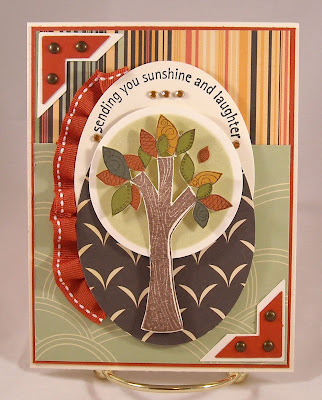 Enjoy today's creation and head on over to the SNSS page to join in on the challenge fun!! Sweet 'n Sassy Release Day - Take Two! This week's challenge was brought to us by Stacy and based on, what is commonly referred to as, the love chapter from 1 Corinthians 13. "If I speak in the tongues of men and of angels, but have not love, I am only a resounding gong or a clanging cymbal. If I have the gift of prophecy and can fathom all mysteries and all knowledge, and if I have a faith that can move mountains, but have not love, I am nothing. If I give all I possess to the poor and surrender my body to the flames, but have not love, I gain nothing." I didn't have any stamps based on this verse but I loved this one from 2 Samuel that assures us that God's ways are perfect because His way is tested and tried. Every day we're faced with choices. We can choose to give in to our sinful, imperfect desires and emotions or we can choose to follow God's perfect ways. I tell my kids every day that you can never go wrong following God. Every command He has is for our own benefit, not His. He loves His children, He wants what is best for them and so when we read His word and strive to model our lives after Christ, we can't lose! It will go well for us...So each day we have a choose to make, we can choose to exhibit love towards our family, friends, and neighbors or we can choose to be driven by impatience, selfishness, frustration, anger, or indifference. Which option do you think will produce the best results? I once heard someone say that if you want to 'feel' love for a person that you need to 'act' in a loving way, whether your emotions are fully engaged at the time or not. When we act in loving ways, it stands to reason that our emotions will catch up. What's the cure for fighting those unloving emotions? For the Christian, it's through earnest prayer and reading of God's word. For the unbeliever, the answer is wrapped up in Christ who offers forgiveness, redemption, and never ending, perfect love. Seek Him while He may be found and may today be the day of your salvation! 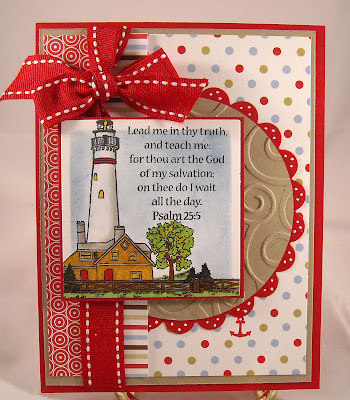 My card is a simple layout (based on this week's Mojo Monday sketch), highlighted with a verse from Sweet 'n Sassy. By the way, today is the Sweet 'n Sassy release day! Be sure to head over to the web site to view all of their new, amazing sets! 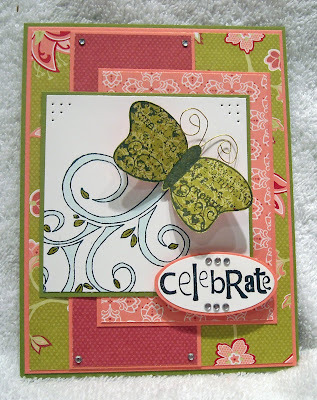 The paper is from from a Cosmo Cricket paper pack from Taylored Expressions. Wishing you all a blessed day - thank you for stopping by and please hop over to the SALT blog to see the rest of the team's beautiful artwork! Sweet 'n Sassy Release Day Tomorrow! The countdown is on!! 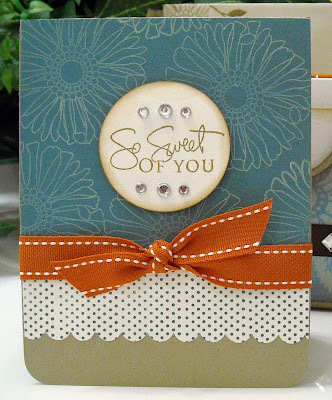 One more day until Sweet 'n Sassy releases a boatload of new sets! Be sure to stop by the web site tomorrow to check out the goodies! Today's card is showcasing the exact stamp that I used on Sunday's Keep it Simple card. Can you believe it's the same stamp? 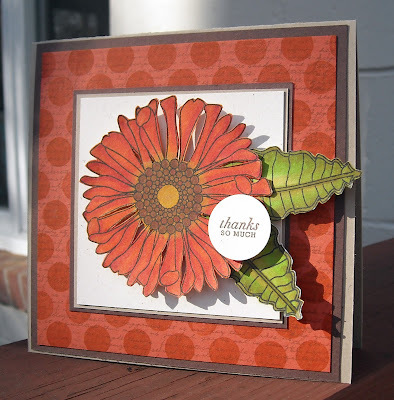 The looks are so different...I love the versitility of these beautiful floral stamps! This is the iris stamp, which is one of three flower of the month stamps being released tomorrow. I paired this image with a sentiment from another set being released tomorrow, Melody of Love. (And I just released I haven't shared my Melody of Love card yet! On my list of things to do this week!) :-) The image was colored with Copics and mounted onto my all time favorite, a scalloped circle. Enjoy and be sure to check in to the Sweet 'n Sassy site tomorrow!! It's another sketch challenge! This one comes from the Midnight Madess Sketch blog. I heard about this site from one of my cards posted on SCS. One of the team invited me to check out the site so I did and found this week's sketch to be a fabulous challenge! It's funky, no? This adorable tree stamp, and sentiment, is from the latest Unity KOTM set and I stamped it on cream cardstock and then painstakingly cut out each leave from color cardstock before attaching to the original stamped image. The sketch called for a flower on the left side of the card but I went with the ruffled ribbon design that Lisa Johnson made famous. I've been itching to do this technique with my ribbon and this was the perfect chance! 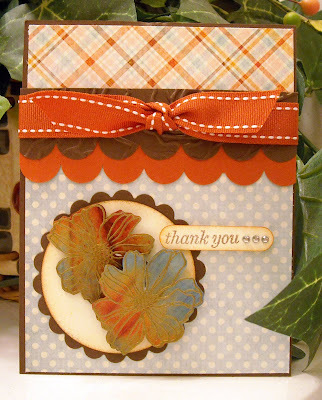 The lovely patterned paper is from a Cosmo Cricket paper pack, purchased from Taylored Expressions. 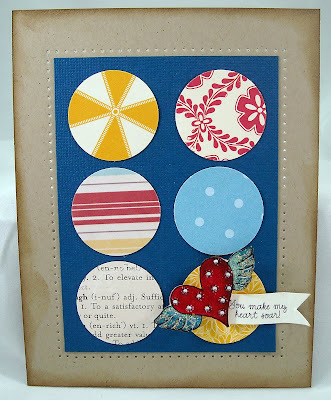 I just love these 6x6 paper packs and am toying with replacing all of my 12x12 with these easy to store packs! :-) If you're interested in these weekly sketch challenges, that include prizes, check out Priscilla's blog for all of the details. Now I'm off to get my sketch posted since today is the deadline! :-) Working on a fun project that I'm looking forward to sharing in the next few weeks...I'll post some sneak peeks soon! I just love skech challenges! And The Sweet Shop (hosted by Sweet 'n Sassy stamps) is a new site that I just recently found out about (yes, I've been living in a closet!) Each week The Sweet Shop posts a new sketch challenge and since my buddy Julie is one of the newest members of the design team (congrats Julie!! ), I had to play along! For this week's sketch I decided to pull out a Sweet 'n Sassy stamp set that I purchased at the Stamping Around PA event titled, Light of the World. I love the ocean and lighthouses so when I saw this set I knew it would have a good home with the rest of my stamp collection. This is a beautiful stamp, my card is showing just a portion of the large lighthouse stamp included in the set. 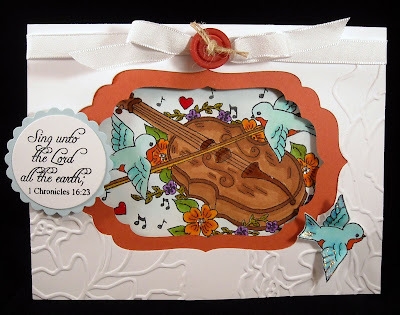 The set also comes with six sentiments and/or verses, one of which is used on my card....a beautiful verse from the Psalms. The image was colored with Copics and the remainder of the supplies used on the card are from Papertreyink. Hey, that nautical paper I picked up at Summer CHA has finally come in handy! Enjoy this Monday morning! We're finally back to our regular routine and I've managed to actually put on real clothes (vs. my 'lounging pants' that I've been living in) and added make up to the 'ol face! My husband almost fainted this morning! LOL! Now to pry myself away from Google reader and get the schoolwork started! 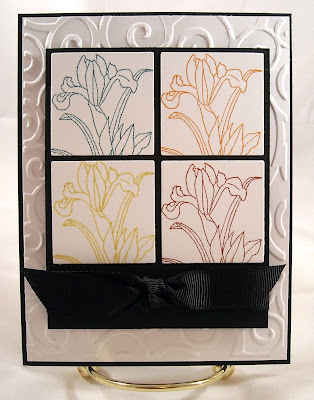 Today's Tip: Stamp the same image in four different ink colors to create a modern themed card! Today's card was created using another soon-to-be-released Sweet 'n Sassy image. 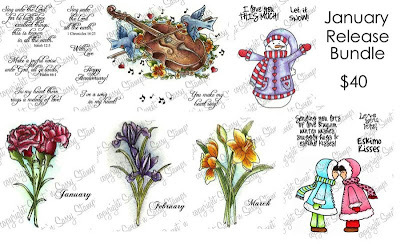 This month, SNSS is releasing three mini stamp sets, all designed by Leah Cornelius, titled Birth Month Flowers. 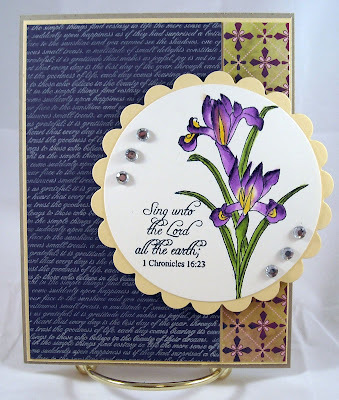 A few days ago I shared January's flower, the carnation, and today's card showcases February's flower, the iris. Each flower image also comes with it's respective month stamp; what a perfect combination for creating a yearly calendar. The images can be purchased individually or as a set of three. I adore floral images and have been just thrilled with these stamps...I can't put them down and have a stash of cards left to share! My card was super easy so not a ton to explain...I simply stamped the image four times, on white cardstock, in four different colors and then cut out a portion of the image with a Cuttlebug and Nestibilities dies. The squares were mounted on a piece of black cardstock and the card base has been embossed for some added texture. A black ribbon was the finishing touch! Enjoy!! I've seen this on a few blogs today and thought it was kind of cool...And since I don't have much to post today (I'm still recovering from going to bed at 2am! ), I'm following suit and posting a few of my favorite projects from 2009. That's the journey for today! I hope you enjoyed and I'm wishing everyone a very happy new year!! Thank you so much for your visits and comments, each is truly appreciated! !